Mundraub means ‘mouth robbery’ in German. 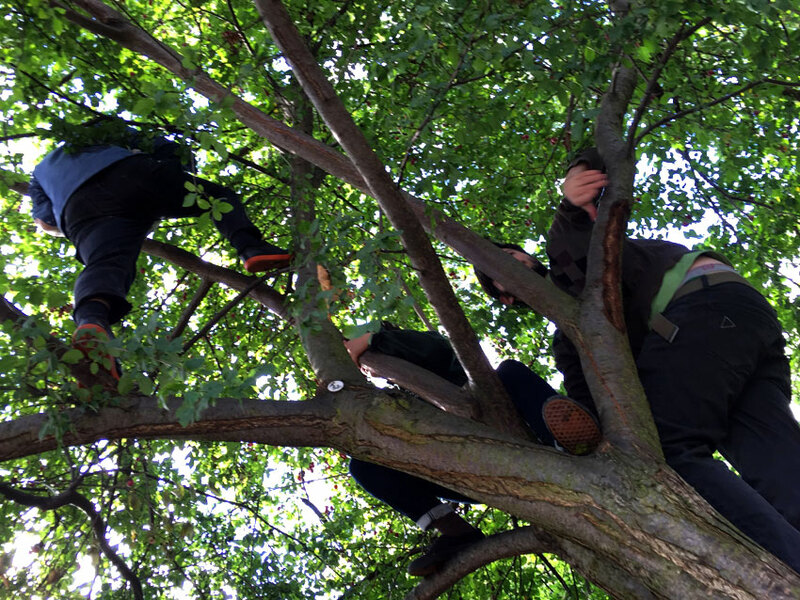 The site is organised by volunteers and calls people to ‘experience the edible landscape through petty larceny.’ There are many other similar sites, such as fallingfruit – which aims to ‘map the urban harvest’ – and while it is quite well maintained in North America, it’s not as popular in Europe. 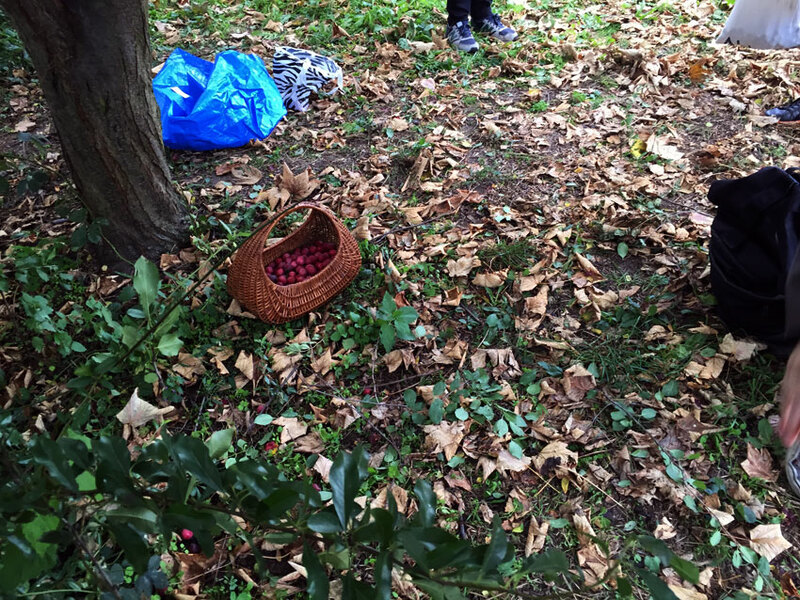 Both sites, however, offer an excellent service to those interested in foraging. I was looking around the map one day and noticed that someone had marked a Goji Berry tree – in fact I had never seen a Goji Berry tree before, and the most I knew is that the fruit is very expensive. After researching what these trees look like, I rode my bike to the area indicated on the map, but unfortunately there was no sign of any Goji trees. This happens often when using these sites, but you can’t let it dissuade you from the hunt. I walked around the area and found lemon sorrel (Rumex acetosa), yarrow (Achillea millefolium) and several large crabapple trees, but the best find came last: a huge red plum tree burdened with ripe fruit. I called Mei, Adriaan and some other friends and the next day we headed back, bags and baskets in hand. 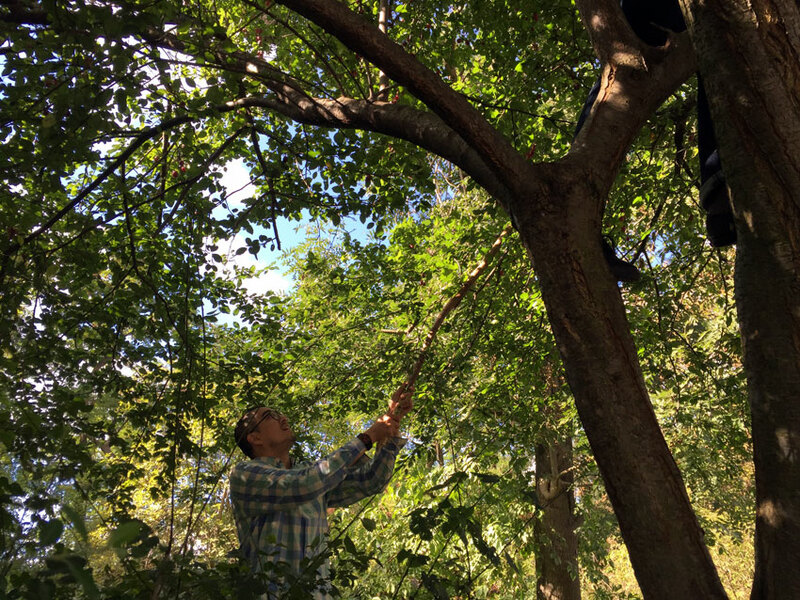 When you’re picking larger wild fruit, remember that you’re not the only one doing so. It’s likely that birds have gotten to it before you and they’ll leave tell-tale signs in the forms of small, round holes where they’ve pecked at the fruit. Better to leave those fruits on the tree, but if you do pick some, remember to discard them where you are so that less discriminating creatures can still enjoy them. Once you’ve found a good fruit tree, stop back as often as you can while it’s producing. Mei told me that she and Adriaan went back a week later and the fruit was much more tart. Tart fruit is still fine to use, but you might use it differently – in the case of plums, steeping them in sugar and a neutral alcohol like vodka for a few months makes a very nice drink. You can get an idea of that process here, where the author is making mae-shil-ju, a Korean liquor made with sour plums. Of course you’re not limited to booze, there are many excellent recipes you can find through the internet, old books about canning, or other foragers. 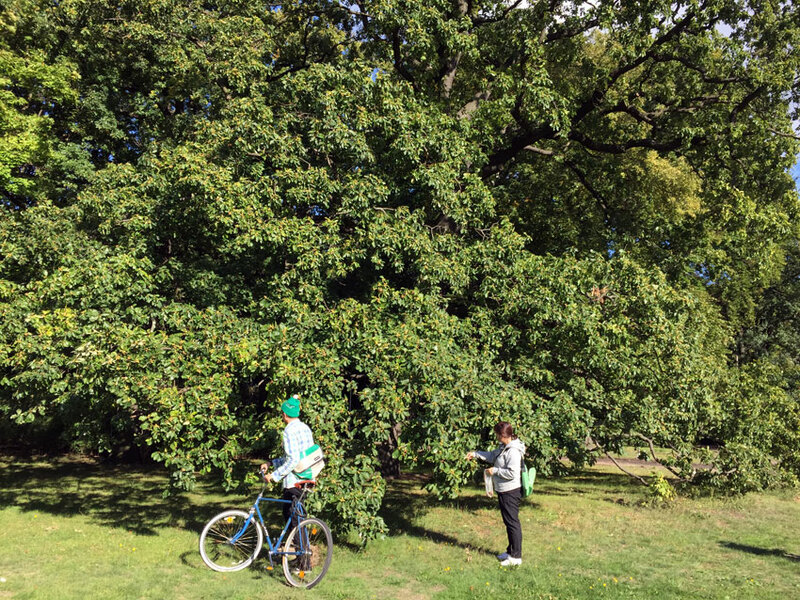 After we picked as many plums as we could hope to carry and use, we headed through Treptower Park in search of a pear tree that was also listed on Mundraub. 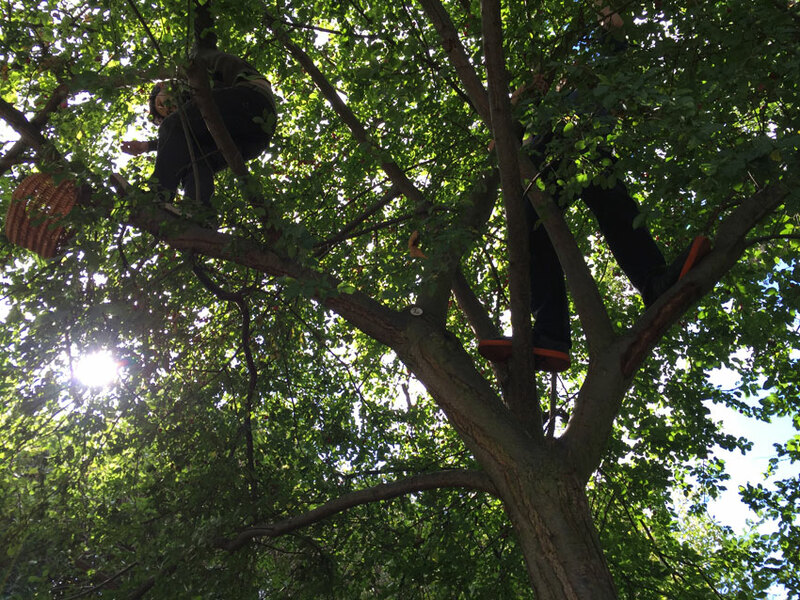 While searching, try to look not only for the tree, but the environment you would expect it to inhabit. In our case, where we thought the map indicated the pear tree should be located was in deep forest – which is not likely because pears (and most other fruit trees) like full sun. That helped us to broaden our search and look instead towards the treeline and other areas that got more light. 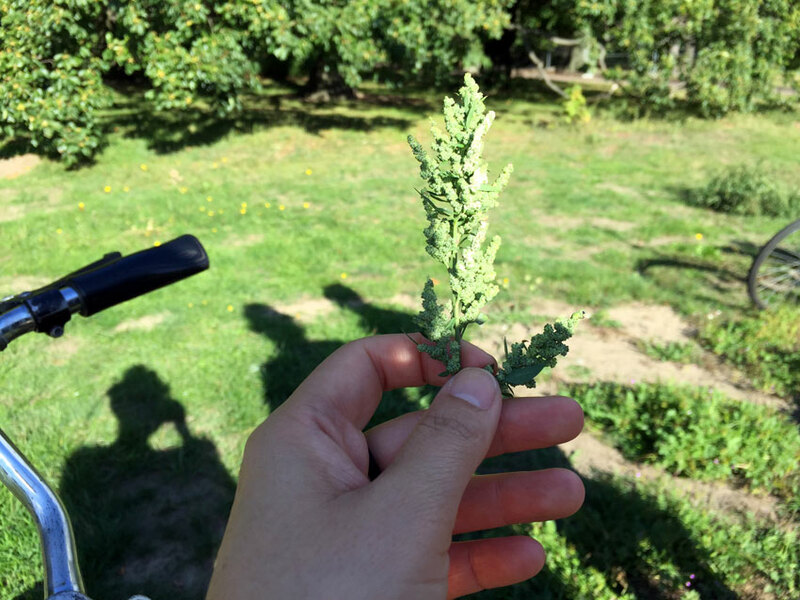 We never found that pear tree, but we did identify some other useful wild plants, such as the lamb’s quarters (Chenopodium album) in the photo below. I think the leaves can still be eaten in the late summer and early fall, but they’re much better in the spring. The seeds, however, are great to collect and dry in bunches in the autumn for use during the winter. I like to add them to fruit and yogurt along with other seeds, but they can also be used for various Indian dishes or even ground into a flour. 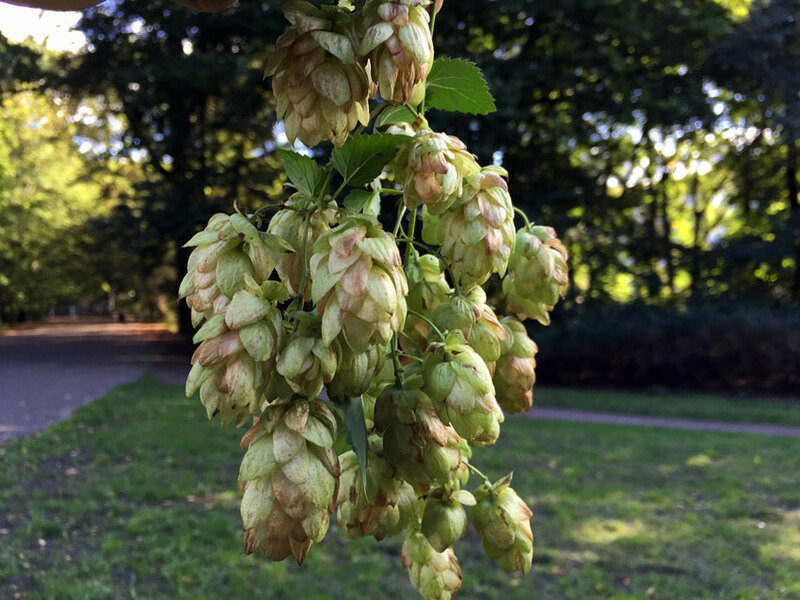 Wild hops (Humulus lupulus) grow everywhere in Berlin and it’s not uncommon to see them climbing up fences or gates even in the middle of the city. We found these on the East side of Treptower Park crawling up the remains of some blackberry bushes. Next we found an enormous Oak tree with many large acorns. Processing acorns is long, hard work but the reward is a nutty, high-fat flour that’s great to use for pancakes and even fried chicken. Parking strips in cities are dosed with pollution from car exhaust, runoff water from dirty pavement, and dog feces, which raises questions about how safe it is to grow food there. Studies suggest that plants on less busy streets, those with fewer than 1000 cars per day (about one per minute in the day time) don’t accumulate worrisome levels of pollutants from cars. Some authorities put the limit at 2500 cars per day. That is even talking about plants which are directly on the road and I rarely harvest those plants. There are some who are much more strict in what they harvest and others much less so, and this is often situational. Use your judgement and find the best out of the way places for you to forage. That might be a local park, a vacant lot or a lonely street which is somewhat isolated from cars and other pollution-generating traffic. We hope to organize some foraging walks in the spring, but please check out (and contribute to!) 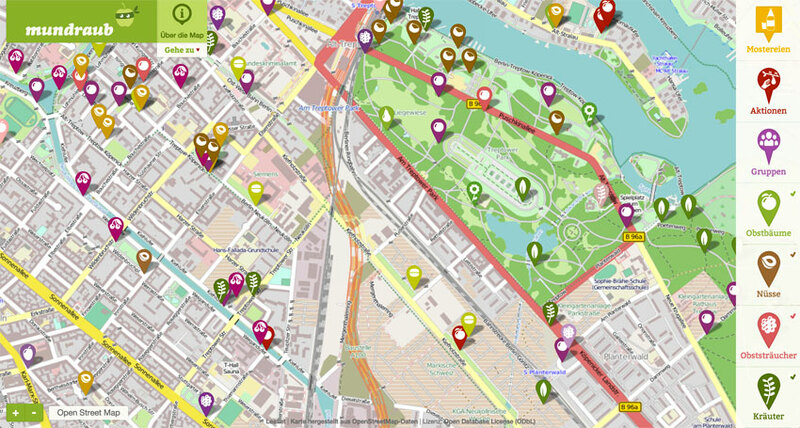 whichever urban foraging site is most used in your area. These are a great way to start becoming familiar with local plants while also harvesting delicious fruit, spending time in nature, and shrinking your foodshed, with all of the associated benefits that entails.